Context carries tremendous importance in disambiguation of meanings as well as in understanding of the actual meaning of words. The word “architecture” is exemplary in this regard. So first I will focus on the contexts in which the word “architecture” is being used. Without understanding the different contexts, there is no clear road to a defining story. For the moment, I will just ignore the enterprise, the domain of prime interest. It is just about “architecture” in general as there must be a reason that the word is used across widely diverse domains. So then, what are the different contexts? One fact is clear. Dictionaries offer only limited assistance as they show little formal recognition of those contexts. Without yet trying to determine the difference between architecture and the remainder of design, it feels right to state that, both design and architecture represent arrangement or structure. Centre piece is concrete structure (A), the actual state of structure (states are boxes) as it exists in the reality of a building, a city, a software-intensive system or a social system (for example an enterprise); any object or system really. Concrete structure is often not really static, thus not a state but in order to get to understanding it is conceived as an image being taken thereby capturing the moment and so turning it into something static (The same recipe is applied for the other states for which the notion of a baseline is common practice). Mostly, the dynamic aspects of especially architecture over a small period of time are of limited concern anyway. There are reasons why, that I will tackle later. In other words, concrete structure either emerges (1), is engineered, or is a mixture of both. Engineering is a composite action; it consists out of several other. A key means in an engineering effort of any concrete structure is a structure plan (E), either a mental plan or a material plan that, by addressing necessary action and targeted concrete structure, assists in the realization (3). The conception (7, 2) of any structure plan seems to be either based on something that has been proven to be wrong, hence the negative outcome of structure assessment (C) or to be right, the structure template (D). 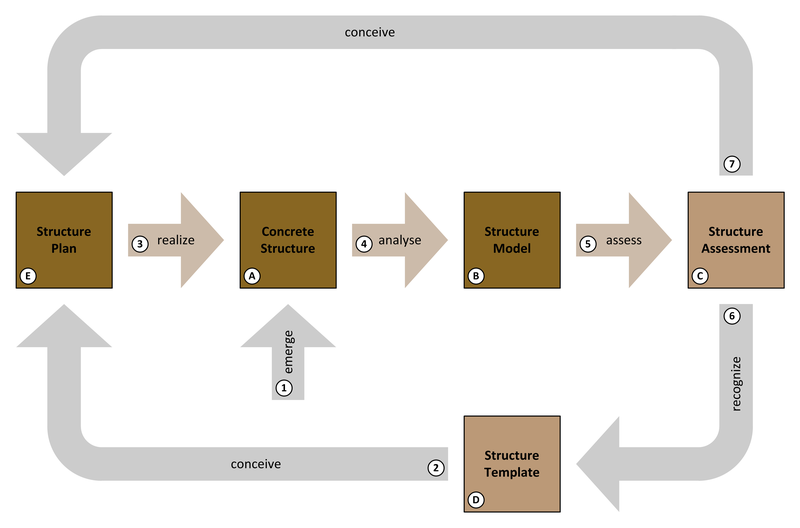 Structure templates are structure styles, patterns and/or tactics, or combinations of those in the form of reference models, with both structure as state and as action, that have been recognized (6) as proven to be right for specific purposes based on the positive outcome of structure assessment. Typical examples of structure templates in building architecture, styles in fact, are Romanesque architecture, Gothic architecture, etc. Of course there is the action of selecting proper and/or recognizing improper structure templates and properly (re-)combining for the now targeted concrete structure, the conception (2, 7) of the structure plan. Hence it is in this action that the purpose of the targeted concrete structure is to be taken in account. Concrete structure is often difficult to understand, especially when it is at least in part result of emergence for which obviously no structure plan can be available. Hence, it is appropriate to analyse (4) concrete structure in order to build an understanding through the creation of a structure model (B). Structure plan and structure model can show similarity only when the concrete structure is highly engineered. Anyhow, the structure model will only offer a representation based on specific concerns, a simplification for the further purpose of either single or comparative assessment (5). Single assessment can lead to re-engineering so to better align structure with purpose. Comparative assessment can lead to the recognition (6) of structure templates. The words design and architecture are used as being all of the above, as the concrete structure, the structure plan, the structure model, the structure assessment and the structure template, as well as the practice of conceiving, realizing, analysing, assessing and recognizing.